When it comes to the 2019 Super Bowl ads, we've got some high expectations. The unofficial competition for the 'best Super Bowl commercial' crown is already underway, with some awesome-looking teasers from the likes of Pepsi, Doritos and Bumble. But what will the full ads look like? And will they be put into the shade by as-yet-unseen spots from Audi, Kia, Mercedes-Benz, Toyota, Disney, Verizon, the NFL itself and others? Few events generate as much global buzz as the American Super Bowl, which this year takes place on Sunday, 3 February 2019. And for creatives, there are plenty of branding lessons to be learned from the world's biggest players – not to mention some spectacular set and costume design during the halftime show. Happily, if you want to catch the action this year, there are a number of ways to live stream the Super Bowl 2019 for free no matter where in the world you live. 01. Download a VPN service – our favourite is ExpressVPN, which has a huge 49% discount right now. 02. Connect to a server location: if you just want to watch the game, the UK is the best place to find the Super Bowl being streamed for free (go to TVplayer.com and select BBC One); whereas the US is the best place to catch the commercials. Get Express VPN for almost half price now. As a sports event, the annual showdown between the two best American football teams in the NFL – this year, the New England Patriots, and the Los Angeles Rams – is exciting enough. But its cultural importance extends beyond this. 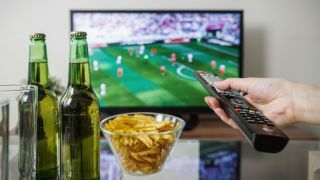 Treated by many Americans as an unofficial holiday, Super Bowl Sunday is a time for friends and family to gather together, sink a beer, eat unhealthy snacks and watch TV. And it's a real occasion: more food is consumed on this day, for example, than any other day of the year, save Thanksgiving (including an estimated 28 million pounds of potato chips and 1.25 billion chicken wings). Plus, as we've mentioned, it's not just about the sport. The biggest global pop stars perform during the half-time show, and the specially made TV commercials have become an art form in themselves. With the cost of advertising rising to an eye-watering $150,000 per second, brands have never before had such an incentive to create something truly special. Their challenge is to capture the world's imagination and change the way we think about them overnight. We may be living in the era of time-shifted TV and Netflix boxsets, but every now and again, something approaches that reminds you of the thrill of watching TV live – along with millions of people round the world. This Clio-award winning Super Bowl commercial, shown during the 1979 showdown between Los Angeles Rams and the Pittsburgh Steelers, appears in countless lists of the greatest ads of all time – and for good reason. The setup is simple, classic advertising, effortlessly tugging on the audience’s heartstrings. A nine-year-old boy approaches the notoriously surly Steelers defensive tackle ‘Mean Joe Greene’ after a game as he limps back to his dressing room. The child offers him his Coca-Cola but gets only a scowl, and turns away dejected. Then comes the payoff, as the player calls after him, smiles, and throws him his jersey. There’s nothing flashy about this Super Bowl ad. It’s just about giving the viewer a sweet, feel-good moment that’s grounded in a sense of reality; both Greene’s injuries and aggressiveness seem real, making his eventual smile all the more winning. Art directed by Roger Mosconi and written by Penny Hawkey, the footage was shot in May 1979 at a small stadium in Mount Vernon, New York. Greene later recalled that he’d had to do a number of takes of the final line without burping. "Between me belching and going to the men's room, it took three days to film it," he told the Baltimore Sun. Creative lesson: By telling a simple story that’s anchored by a sense of realism, it’s possible to make an emotional connection with the audience that takes seconds, but lasts a lifetime. Nowadays, we’re used to Super Bowl ads with big budgets and epic visions. But in 1984, audiences had yet to experience such things. And then Apple came along and blew their minds – or made them utterly befuddled – depending on who was watching. At the time, IBM dominated the personal computer market and Apple was struggling to break through. So to announce the launch of the first Apple Macintosh computer, director Ridley Scott created something that was less a standard ad and more a mini-movie. This Apple Super Bowl ad presents a dystopian world similar to that envisioned by George Orwell’s novel 1984. Cue an unnamed heroine, played by English athlete Anya Major, who represents the coming of the Apple Macintosh as a means of saving humanity from "conformity". The OTT ad was widely ridiculed, but Apple didn’t need to appeal to everyone; just the minority who were interested in buying this relatively new device called a personal computer. And their strategy undeniably worked. About $3.5 million worth of Macintoshes were sold just after the Super Bowl commercial ran, and the company didn’t even need to pay for the ad to be shown again, because so many TV shows reported on it, and rescreened it for free. Creative lesson: Advertising doesn’t need to please everyone, just the target audience, and ultimately that’s the only measure of success worth worrying about. A full 20 years after this Budweiser Super Bowl ad aired at the 1999 play-off between the Denver Broncos and the Atlantic Falcons, its catchphrase remains instantly recognisable to an entire generation of viewers. The Super Bowl commercial was created by DDB and directed by Charles Stone III, based on a short titled True, which he had previously made and shown at film festivals. It has since been recreated and parodied countless times, and won numerous awards. But more importantly, after airing at the Super Bowl, the catchphrase was repeated incessantly by ordinary people worldwide in a way that has rarely ever been matched by an advertising slogan. In a largely pre-internet world, it’s an example of how you don’t necessarily need the web to make a viral impact on popular culture. Creative lesson: In an era in which advertising experts pour over spreadsheets of page views and social shares, it’s important to remember that you don’t need technology to get into people’s heads: a great idea will spread regardless. These days, the world might be getting a little bit weary of the Star Wars juggernaut, with new movies appearing all the time. But back in the pre-Force Awakens year of 2011, Star Wars nostalgia meant that this clever conceived Super Bowl commercial for Volkswagen was an instant hit. Aired during the 2011 Super Bowl between the Pittsburgh Steelers and the Green Bay Packers, the ad shows a young boy dressed in a Darth Vader costume trying to control items around the house, including the washing machine and clothes dryer, using ‘The Force’. As his efforts fail, he becomes increasingly disheartened. Then he tries his magical powers on the family car, and is astounded when it roars into life… although the viewer knows that it’s actually his dad using the remote control. Directed by Lance Acord and produced by Park Pictures for Deutsch, the Super Bowl ad features note-perfect acting and makes excellent use of the ‘Death March’ music from the Star Wars movies to push our nostalgic buttons . But most importantly, it taps into a primal desire, especially in children, to be able to assert control in a chaotic world. It quickly became the most shared Super Bowl ad of all time on YouTube. And more broadly, it’s credited for changing the way the industry approaches Super Bowl campaigns in general, putting much greater emphasis on internet previews before the game and the use of social media to drive interest. Creative lesson: Nostalgia is a powerful tool in advertising. But it only really works if it’s combined with a simple, killer concept; one that’s easy to understand and clearly ties in to the overall branding message. For ads to make that emotional connection that’s vital to success, humour can be a powerful tool. But Super Bowl ads don’t have to be funny. Serious can work too. The speech is used in this 2013 Super Bowl ad for Ram Trucks, accompanied by a slideshow of stirring photography of real-life farmers. It's a campaign that associates Ram Trucks' brand with the traditional values of rural America; which is a far more powerful and engaging proposition than just talking about speed and performance. Created by The Richards Group, the ad was made in collaboration with the National FFA Organization, a youth organisation promoting agricultural education, to which Ram agreed to donate up to $1million based on the number of YouTube views it received. It got 108 million in 2013 alone, making it easily on of the best Super Bowl commercials ever. Creative lesson: Advertising that taps into shared values can be more effective than focusing on the specifics of a product. And if serious money is raised for charity as a result, accusations of empty sentiment can be easily batted away. In the 2010s, TV audiences had become increasingly sophisticated. But this 2013 Super Bowl ad starring Hollywood stars Seth Rogen and Paul Rudd, and directed by Jon Favreau of Iron Man fame, pushed the envelope of knowing irony like nothing before it. In this extended comic sketch, shown during the 2013 Super Bowl between the Baltimore Ravens and the San Francisco 49ers, Paul Rudd and Seth Rogen are asked to come up with an idea for a Super Bowl commercial for Samsung. A highly charge and increasingly ridiculous brainstorm meeting ensues with a narcissistic adman played by Bob Odenkirk (known best as Saul Goodman in Breaking Bad) that perfectly parodies both the ad industry and advertising itself. Even the product placement of Samsung devices is ironic. For the intended audience, it was the perfect ad for the age – earning its place in our round-up of the best Super Bowl commercials ever. Throughout the 2010s, brand loyalties have become more fluid, and this ad recognises that, leaving behind the hard sell and replacing it with a prime piece of entertainment that’s finely honed for tech-savvy and social media oriented audiences. Creative lesson: All brands must move with the times and reflect how the audience is, not how you’d like them to be. In the 2010s, most of us don't want to pick sides in the smartphone wars, we just want something that works, from a brand we can trust. Give us an ad that’s fun and relatable, and the rest will follow.